Rudger Judd Clawson (March 12, 1857 – June 21, 1943) was a member of the Quorum of the Twelve Apostles of The Church of Jesus Christ of Latter-day Saints (LDS Church) from 1898 until his death in 1943. He also served as President of the Quorum of the Twelve Apostles from 1921 until his death and as a member of the First Presidency of the LDS Church for five days in 1901. Clawson was born in Salt Lake City, Utah Territory, to Hiram Bradley Clawson and Margaret Judd of Canada. While serving his mission in Georgia, he faced many challenges, not the least of which was the mounting anti-Mormonism in that sector. On July 21, 1879, Clawson and his missionary companion were standing at Varnell Station, Georgia, when they were surrounded by an angry mob of anti-Mormons. One of the mobbers shot and killed his companion, Joseph Standing. One of the mobbers then turned and pointed to Clawson, and said, "Shoot that man!" Clawson coolly faced the mob and folded his arms. He exclaimed, "Shoot!" The mob soon dispersed in the face of Clawson's defiance and willingness to face the mob. He brought the body of his deceased missionary companion back to Salt Lake City, where a public funeral was held in the Tabernacle. Clawson became somewhat of a celebrity for his bravery that day. August 1882 was a difficult time for Clawson, as he became the first practicing polygamist to be convicted and serve a sentence after the passage of the Edmunds Act. During the trial, one of his wives refused to testify against him. She was put in prison for contempt of court. Judge Charles S. Zane sentenced Clawson to the maximum possible penalty—he was punished with 3​1⁄2 years in prison and a $1500 fine. For his final words before being sent to prison, Clawson defended his right to practice his religion and challenged the court's ability to enforce a law aimed at destroying a particular establishment of religion in violation of the First Amendment to the United States Constitution. His appeal was heard and rejected by the Supreme Court of the United States in Clawson v. United States. Clawson was pardoned in 1887 by President Grover Cleveland mere months before his sentence was to expire. Clawson was ordained an apostle and member of the Quorum of the Twelve Apostles on October 10, 1898. He was asked to serve as second counselor in the First Presidency under church president Lorenzo Snow on October 6, 1901, but Snow died just four days later. In 1904, the town of Kingsville, Emery County, Utah, was renamed Clawson in his honor after he visited the town to organize a ward. That same year, Clawson married Pearl Udall, daughter of David King Udall and Eliza Stewart Udall. In 1921, Clawson became the President of the Quorum of the Twelve Apostles. He served in this position for 22 years, the second-longest tenure for this position in the history of the LDS Church. 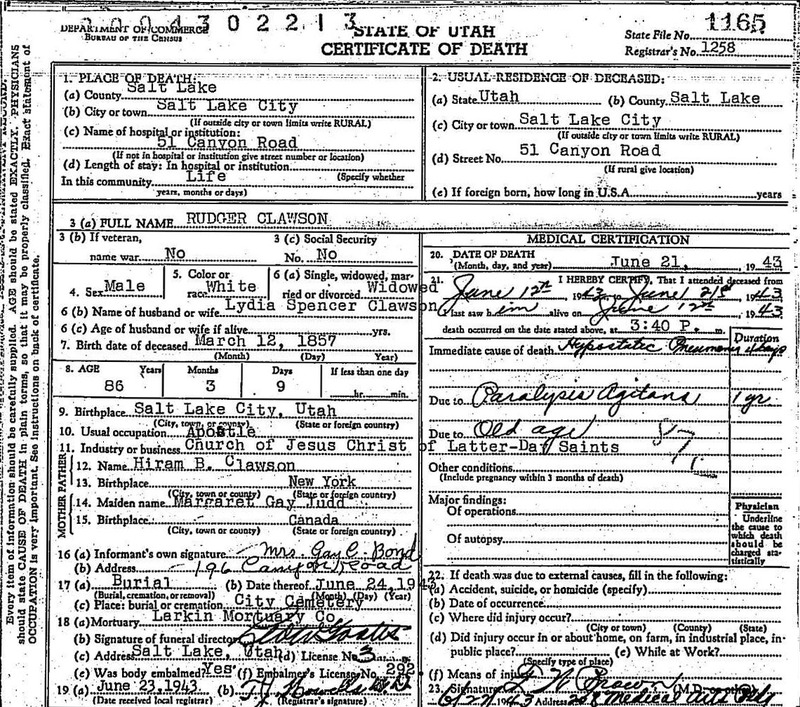 Clawson died from pneumonia at the age of 86 in Salt Lake City. He had served in the quorum for a total of 45 years. He was buried at Salt Lake City Cemetery. Clawson, Rudger (1993a). Larson, Stan (ed.). A Ministry of Meetings: The Apostolic Diaries of Rudger Clawson. Salt Lake City: Signature Books. ISBN 0-941214-96-6. OCLC 25317571. —— (1993b). Larson, Stan (ed.). Prisoner for Polygamy: The Memoirs and Letters of Rudger Clawson at the Utah Territorial Penitentiary, 1884-87. Urbana: University of Illinois Press. ISBN 0-252-01861-3. OCLC 23731930. ^ Van Wagoner, Richard S. (1989) . Mormon Polygamy: A History (2nd ed.). Salt Lake City, Utah: Signature Books. p. 119. ISBN 978-0-941214-79-7. LCCN 85063399. OCLC 19515803. ^ Orson Hyde served in the position for 28 years—from 1847 to 1875. Hoopes, David S.; Hoopes, Roy (1990). The Making of a Mormon Apostle: A Story of Rudger Clawson. Lanham, Maryland: Madison Books. ISBN 0-8191-7298-7. OCLC 19514770. Nicholson, John (1886). The Martyrdom of Joseph Standing; or, The Murder of a "Mormon" Missionary: a True Story. Salt Lake City: The Deseret News Company. OCLC 11376948. ^ a b c d e f g h i j Never a member of the Quorum of the Twelve Apostles. ^ a b c d e f g h i j k l m Term ended by excommunication. ^ Term ended by resignation. ^ Term ended by removal of apostleship; was later excommunicated. ^ Term ended by suspension of priesthood. This page was last edited on 11 April 2019, at 00:36 (UTC).